Check out MOST Calendar for up coming events and add your own . The conceptual framework adopted by Growing Up in Ireland is described in full in Greene et al., (2009). It emphasises children’s connectedness to the world within which they live. It also highlights the importance of considering the multifaceted nature of the influences on development over the life-course. The conceptual model incorporates a model of the child’s relationship to the world outlined by Bronfenbrenner in 1979 and further developed in later years. Bronfenbrenner’s work offered a re-conceptualisation of the child’s ecology as a multilayered set of nested and interconnecting environmental systems all of which influence the developing child, but with varying degrees of directness. The perspective has evolved since its early inception and today acknowledges the role of the child’s own characteristics, including biological factors in the overall development of the person, hence the model is now referred to as the bioecological model (Bronfenbrenner & Morris, 2006). 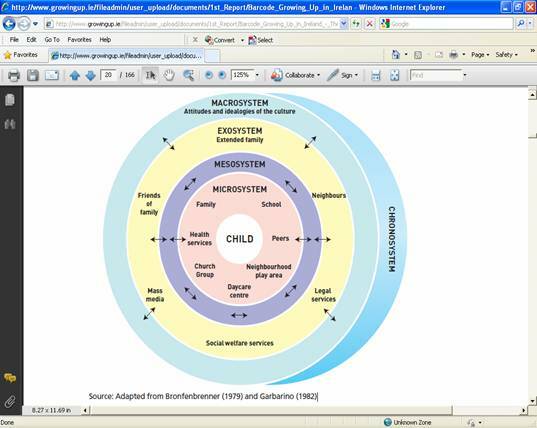 Within the bioecological model, the child is located at the centre of a set of concentric rings that represent the ecology of human life (Bronfenbrenner 1979; 2001). These systems are layered in terms of their influence on child development. In Figure 1.1 these systems or layers are represented as concentric circles, extending outwards from the individual child and his or her personal characteristics. Parents (and family members such as siblings and grandparents, if they are present) are the most influential part of the ecology in early child development as are, for example, school and childcare arrangements. As these have the most direct contact with the child, they are represented in the circle or layer immediately surrounding the individual (the microsystem). Other relationships within the household, aside from the child’s relationship with one or both parents, matter but parents and children also have relationships outside the household, for example in school and in the workplace, that connect the household to the wider community. To Bronfenbrenner this illustrates the intimate relationship between the microsystem, the face-to-face interactions which the child experiences, and the mesosystem, which encompasses the interactions amongst contexts in the microsystem – how families interact with schools, how parents’ worklife impacts on their parenting, how close family interacts with extended kin. Outside the mesosystem in Bronfenbrenner’s model sits the exosystem. This comprises the structures, institutions and settings which, whilst not in direct contact with children, exert an important influence upon their quality of life and outcomes. Examples of influential elements within the exosystem would be the Departments of State, which will have an important impact on their wellbeing through the systems they control, such as welfare services. The last ring of Bronfenbrenner’s schema is the macrosystem. This consists of the culture-specific ideologies, attitudes and beliefs that shape the society’s structures and practices as well as economic and political systems. Together these four levels (and the linking mesosystem) provide a comprehensive description of the wide range of factors that may influence the experiences and wellbeing of a child as he/she develops from birth to adulthood. The passing of time during this development, and time as a context for development, is important in Bronfenbrenner’s model. This has two aspects. The first is the individual’s lifetime. The second is the historical time or period effects associated with any particular point in history. Period effects will create a set of unique circumstances for the members of a given cohort. These period effects include the particular sociocultural context at any time, for example in moving from a period of economic boom to recession. In the course of conducting Growing Up in Ireland it will be possible to use this model as a way of understanding the specific and distinctive processes that shape the development of Irish children. By adopting a whole child perspective and by locating the child in his or her complex and multilayered ecology and taking account of the multiple interacting and bi-directional influences on child outcomes, Growing Up in Ireland aims to determine the factors that promote or undermine the wellbeing of children in contemporary Ireland and, through this, to contribute to the development of effective and responsive policies and services for children and their families. The adoption of this comprehensive, ecological framework underpins the decision to seek information on the children from multiple informants. Thus, information on the nine-year-olds is derived from the children themselves, their parents, their teachers and school principals and carers (when the carer has a major role in the child’s life).